Agni Yoga (Russian: Агни Йога) is a spiritual teaching transmitted by the Helena Roerich and Nicholas Roerichs from 1920. Leaves of Morya's Garden believe that the teaching was given to the Roerich family and their associates by Master Morya, the guru of Helena Roerich. Being based on the ancient knowledge of the East and the achievements of modern science in the West, Agni Yoga concerns peculiarities of cosmic evolution of humanity and creates a new system of its perception. The Teaching pays particular attention to the Cosmic Laws that determine the motion of planets and growth of natural structures, birth of stars, and also human behavior and the development of Universe. The authors of the Teaching state that these Laws influence the historic and social processes in human life and unless the humanity realizes this the life can't be improved. According to Agni Yoga, Universe is the immense spiritual-energy system in which a man plays the most important role. The moral perfection, strict observance of ethical laws and comprehension of key factor of Culture in the development of human society are basic principles of spiritual and historical development of humanity. It's impossible to build the better future without respecting knowledge and Culture. Agni (अग्नि ) is the Vedic and Living Ethics God of Fire, one marks immortality and the symbol of life. Agni is one of the supreme gods in the Rigveda. In Agni Yoga it is the Creative Fire of the Universe, the root of the "Fire of Space"; and "psychic energy", the powers of the human mind and heart, particularly those manifesting in love, thought, and creativity. Yoga (ॐ ) is one of the six orthodox schools of Hindu philosophy. There is a broad variety of yoga schools, practices, and goals in Hinduism, Buddhism, and Jainism. Yoga is a group of spiritual, mental, and physical practices or disciplines which originated in ancient India. In the sixteen volumes of the Teaching of Agni Yoga that have been translated into English from the original Russian, as well as in the letters of Helena Roerich, the Agni Yoga teaching is also referred to as the Teaching of Living Ethics, the Teaching of Life, the Teaching of Light, or simply as the Teaching. Being based on the ancient knowledge of the East and the achievements of modern science in the West, Living Ethics concerns peculiarities of cosmic evolution of humanity and creates a new system of its perception. The Teaching pays particular attention to the Cosmic Laws that determine the motion of planets and growth of natural structures, birth of stars, and also human behavior and the development of Universe. The authors of the Teaching state that these Laws influence the historic and social processes in human life and unless the humanity realizes this the life can't be improved. According to Living Ethics, Universe is the immense spiritual-energy system in which a man plays the most important role. The moral perfection, strict observance of ethical laws and comprehension of key factor of Culture in the development of human society are basic principles of spiritual and historical development of humanity. It's impossible to build the better future without respecting knowledge and Culture. A man, according to the Teaching, influences the Cosmic processes greatly. Particular attention is paid to the consciousness of a man and the culture of thinking, as thought is energy, capable of filling space and effecting its surroundings. A man is directly responsible for the quality of his thoughts, words, and deeds, because not only his spiritual and physical health depend on them, but also the condition of the entire planet. 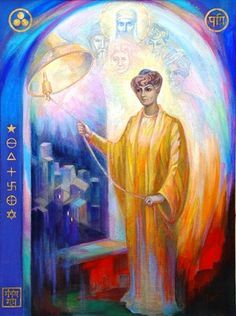 Calling people to live in accordance with Cosmic Laws, the Living Ethics opens unlimited possibilities for the spiritual transformation of life, the expansion of consciousness, and the acquirement of high moral standards. The Agni Yoga Society was founded in 1920 by Helena and Nicholas Roerich. It is a non-profit educational institution incorporated in 1946 under the laws of the State of New York, and is supported entirely by voluntary contributions and membership dues. The aims of the Society are embodied in the philosophy that gives it its name—Agni Yoga—as contained in the books of the Agni Yoga Series published by the Society. In them is found a synthesis of ancient Eastern beliefs and modern Western thought and a bridge between the spiritual and the scientific. Unlike previous yogas, Agni Yoga is a path not of physical disciplines, meditation, or asceticism—but of practice in daily life. It is the yoga of fiery energy, of consciousness, of responsible, directed thought. It teaches that the evolution of the planetary consciousness is a pressing necessity and that, through individual striving, it is an attainable aspiration for mankind. It affirms the existence of the Hierarchy of Light and the center of the Heart as the link with the Hierarchy and with the far-off worlds. Though not systematized in an ordinary sense, Agni Yoga is a Teaching that helps the discerning student to discover moral and spiritual guide-posts by which to learn to govern his or her life and thus contribute to the common good. For this reason Agni Yoga has been called a "living ethic." Speaking about the individual's role in human spiritual evolution, Helena Roerich wrote, "The greatest benefit that we can contribute consists in the broadening of consciousness, and the improvement and enrichment of our thinking, which, together with the purification of the heart, strengthens our emanations. And thus, raising our vibrations, we restore the health of all that surrounds us." The Nicholas Roerich Museum in New York City was originally located in the Master Apartments at 103rd Street and Riverside Drive (Manhattan), which were built especially for Roerich in 1929. Now the museum is located in a brownstone at 319 West 107th Street on Manhattan's Upper West Side. Currently, the museum includes between 100 and 200 of Roerich's works as well as a collection of archival materials and still attracts pilgrims from throughout the world. The mission of the Nicholas Roerich Museum is one: to make available to the public the full range of Roerich’s accomplishments. They cover the realms of art, science, spirituality, peacemaking, and more. The Nicholas Roerich Museum in New York is the largest center of Roerich-related activity outside of Russia. The World Organisation of Culture of Health (WOCH) — International social movement To Health via Culture (Russian: Междунаро́дное обще́ственное Движе́ние «К Здоро́вью че́рез Культу́ру») was founded in the year 1994. Victor Skumin was elected to the post of the President-founder of this organisation. He is an ideologist of Agni Yoga and Roerichism. The WOCH operates in accordance with the registered in Ministry of Justice (Russia)|Ministry of Justice of the Russian Federation Charter. Urusvati knows that people are responsible for three aspects of health. First, their own health; second, the health of the planet; and finally, the health of the Supermundane World... People must safeguard their own health, not only for themselves but also for those around them. The human organism, though seemingly small, is a powerful repository of energy, and truly dominates its earthly environment. It is from these positions that WOCH approaches the solution of problems related to health. As Holy Scripture of Agni Yoga says, physicians can be true helpers of humanity in the ascent of the spirit. The intellect of a physician must be reinforced by his heart. The physician must be a psychologist, and he must not ignore the wondrous psychic energy. It is a most heinous treason to know the Teaching and not apply it. — Agni Yoga # 98. Agni Yoga is a Scripture consisting of a series of books with a total volume of about 5000 pages. (1924). Leaves of Morya’s Garden Book One The Call. agniyoga.org. .
(1925). Leaves of Morya’s Garden Book Two Illumination. agniyoga.org. .
(1926). New Era Community. agniyoga.org. (1930). Infinity Part I. agniyoga.org. (1930). Infinity Part II. agniyoga.org. (1933). Fiery World I. agniyoga.org. ↑ Victor Skumin (1995). Agni Yoga as a method of rehabilitation of the human spirit. ↑ John Bowker (1997). World Religions. New York: DK Publishing, Inc..
↑ Georg Feuerstein (23 October 2012). The Yoga Tradition: Its History, Literature, Philosophy and Practice, Hohm Press. ↑ (1995) The Bringers of the Light (The story of the Roerich family) (in Russian), Novocheboksarsk: TEROS. ↑ Skumin, V. A. (1995). Agni Yoga as a method of rehabilitation of the human spirit. ↑ Aunovska, Olga (1985). Seeds of fraternity. Ukraine 4: 14-15. ↑ Helena I. Roerich. found-helenaroerich.ru. ↑ Agni Yoga Society. agniyoga.org. ↑ Squires, Emily (2000). Spiritual Places, 86, Cosimo, Inc..
↑ Charter of the World Organisation of Culture of Health. Kult-zdor.ru. ↑ Victor A. Skumin. Culture of health is a science of future. The World Organisation of Culture of Health. ↑ (1936). Aum, §3. agniyoga.org. ↑ (1929). Agni Yoga. agniyoga.org. ↑ What is Agni Yoga?. lebendige-ethik-schule.de. Roerich. The Call Of Cosmic Evolution. youtube.com. Lewis Keizer. Nicholas and Helena Roerich. youtube.com.